Sometimes a place does its best to work against you in every way possible. After a few rainy (but spectacular) days in Badlands National Park we decided to hit up the Black Hills of South Dakota, boy was that a bad idea. It’s early May, it’s our first sunny day in a while and the weather here in South Dakota is just beautiful! We pull into our campground and they welcome us with that typical KOA friendly smile and a check-in note saying due to the weather we will be shutting off the water and we may lose power over the next couple days. 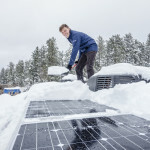 Since we’re fully off grid capable we happily say “No Problem, we can handle a little storm”! We were snowed in for three solid days. Restaurants were closed, roads were closed, breweries were closed and there was no way in hell we were going to get our little Smart Car out of the two foot snowbank surrounding it. Needless to say we had a huge case of CABIN FEVER. 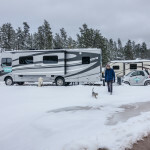 Fortunately the RV park was surrounded by National Forest so we were able to brave the cold for a few mini-hikes with our little snow leopard (Cleo stayed in snuggled up by the fireplace). Our fourth day was absolutely beautiful and all we could think about was getting out to see Mt. Rushmore, Crazy Horse, hike the “mini devils tower” trail and finish it all off with a local brew. We set out with our hopes set sky high for a great day…we should have known better than to jinx ourselves like that. We caught our first glimpse of Mt. Rushmore at a roadside pull-out, and I hate to say it, but we weren’t in awe. We sat in the car and contemplated whether or not we wanted to spend our time inside the national monument. We drove to the other side of the entrance and viewed the George Washington profile. After a little soul searching we decided to skip it and head to Crazy Horse instead since many people claimed they preferred it over Mt. Rushmore. We saw Crazy Horse from the road and thought “there must be more than what we can see from the road”. We drove into the park, but we did a U-turn. It just didn’t feel right. We pull off the highway, eat a snack and talk it through. “For the Good of the People” we say, “it’s our duty to experience and report back”. So we drive back into Crazy Horse and pay the $22 entry fee. Was it interesting? Sure.  Would we do it again or recommend it for travelers with similar interests as us? Probably not. You can see the unfinished monument from the road, and unless you want to pay more money to take the bus or a helicopter to the monument you won’t be able to get a much better view that what you see from the highway. For the comparison we decided to drive back to Mt. Rushmore, pay the $11 parking fee and most importantly take the short walking trails around the monument. FAIL! After paying and parking we get to the visitor center only to find out that all the trails are closed because they are not “safe” as there is still snow on the ground. SERIOUSLY (It wasn’t that much snow) ?!? 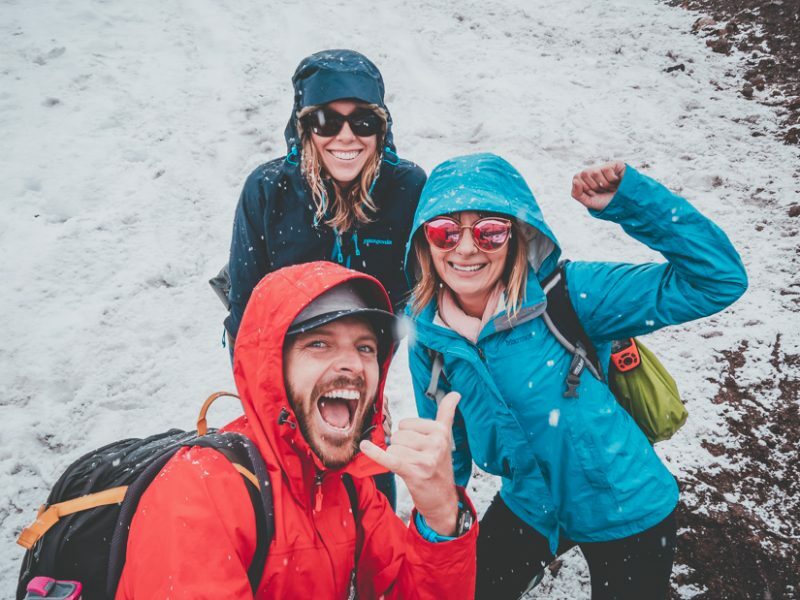 We have proper snow hiking gear and you still won’t let us on the trails? Another major bummer is the afternoon light on the mountain is not as good as the morning light, we just can’t catch a break! The monument is a spectacular feat considering it was created nearly 100 years ago, but for us it’s a piece of man made art that only requires a few minutes to appreciate. As I write my honest opinions I’m feeling guilty, people say this is the most patriotic location but we see it as a commissioned piece of public art that you can’t truly appreciate because you can’t get close enough to it. 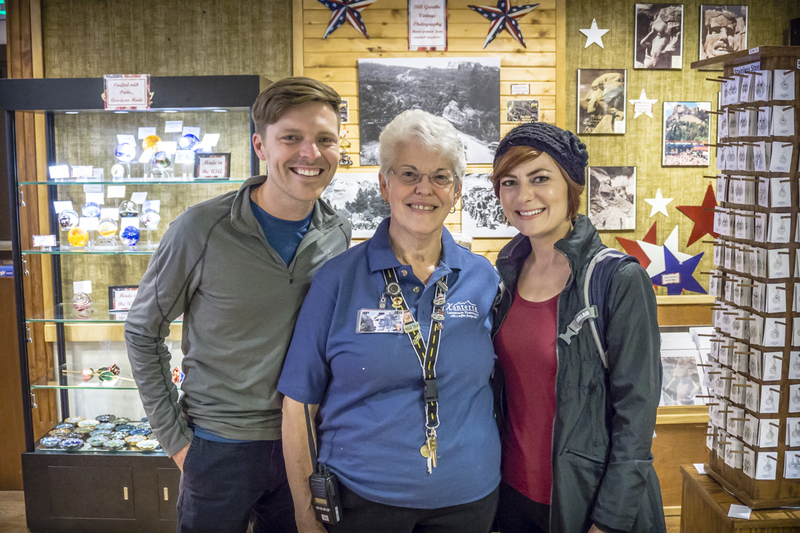 Our biggest thrill here was getting to meet Judy Kerns, an inspirational woman that shared her story with us a while back about her life on the road and how she makes money on the road. Departing Mt. Rushmore with plenty of time for a solid hike we make our way towards two short trails: Cathedral Spires and Little Devils Tower. We were met with this, it was a sign that our day was over (and we visited this area way to early in the season). We stayed at the Mount Rushmore KOA at Palmer Gulch for our Black Hills visit. It’s the first KOA “Resort” we’ve visited and it definitely lives up to its name. The check-in facility is top notch, there’s an on-site winery and coffee shop, a restaurant, off-road UTV rentals, horses and so on. Unfortunately everything was closed during our visit, which was kinda nice because the place was extremely quiet. With a central location to both Crazy Horse and Mt. Rushmore, and being surrounded by the Black Hills National Forest I can honestly recommend this Kampground for all travelers, especially RVers with families. We do our best to be honest to you, our readers, and to ourselves.  We do think the area is worth a visit, but if you’re strapped on time and you’re more into nature than museums you might want to skip the attractions and spend your time hiking in the National Forest or Custer State Park, but that’s just our two cents. Have you been to the Black Hills area of South Dakota? What do you think? All opinions and personal recommendations are greatly appreciated in the comments below, with our limited exploration days coupled with snow, we weren’t exactly setup for success in the area. Disclaimer – All of our opinions are based on our experiences. Thanks to KOA for allowing us to use our vouchers to stay at the park and we really wish we would’ve arrived a bit later in the season. I ended up in Hot Springs SD in the Southern Black Hills for 10 days because I needed a refrigerator cooling unit replacement. Couldn’t have been a better time. The Buffalo Roundup was this past Friday and the fall Volksmarch at Crazy Horse Memorial was today. There is also a Volksmarch at the end of May. In between I’ve done lots of touring in this area. As others have said, weather and timing color the experience. Give the Hills another try, maybe after Labor Day. I am new to your blog and read the South Dakota review first because that is where I live. Your review made me laugh-the weather is super unpredictable and sometimes annoying. South Dakota offers the best hikes, skiing, mountain bike trails, etc. but they are not advertised to tourists. The magic of Mount Rushmore and Crazy Horse exist in the pioneers who made them, not necessarily the end product. The lighting of Mount Rushmore is amazing at night as previously mentioned. The best part of Crazy Horse is the Volksmarch twice a year with free entrance. May is a dangerous time to visit, but you missed the best of the best including Spearfish, Deadwood, Lead. Hopefully you will get another visit in the summer. I think you need to give the Black Hills of South Dakota another chance. I’ve been going there since I was a kid over 60 years ago, and look forward to taking the grandkids there again this summer. The main street of Deadwood is great, especially at the peak of the tourist season, park your RV at Whistler’s Gulch RV Park and take the $1 trolley car down to the main street of town, play blackjack at the #10 Saloon, with the dance hall girls serving free drinks to the players, sawdust on the floor, and they shoot Wild Bill Hickok several times a day in the back room, followed by a gunfight out on the street. Lots to see and do in the Black Hills, including the Buffalo Roundup in Custer State Park every Fall. A great family destination. Cleo & Singha are adorable cats! B. T. W. did you know that ‘Singha’ is a little flower? posts as I travel vicariously with you. I’m in the S. F.
Bay Area. Thanx for all. Recently returned from a six week RV trip from North Idaho to Nova Scotia. Our family of four had a great time, but my favorite single event was the trail run from the same Gulch KOA to the top of S Dakota’s Harney Peak and back. I had no idea it was the highest peak east of the Rockies until I looked it up. There is a stone tower at the very top which provides a fantastic 360* view of these unique mountains. My German Shep made the run with me and was surprised to find a mountain goat in the lower room of the tower. Lucky she was on the leash or she would’ve plummeted to her death chasing the goat as it sprung from ledge to ledge! A surreal experience and fantastic region to explore. Awesome! Next time when we’re not snowed in, we will check it out! Just returned home after 22 days on the road with my 13 year-old daughter. Among others we visited the Badlands, Black Hills, Yellowstone, Redwood National Forest, Torrey Pines, Hoover Dam, and the south and north rim of the Grand Canyon. The Black Hills was my daughter’s favorite. Jewel Cave, crazy zig zag roads with amazing tunnels (that an RV can’t fit through), bison, deer at our campsite and endless places to stop and just start climbing or hiking. Mt. Rushmore felt like Disney yet there was a lot of good information in the Visitor Center. We’re sad we couldn’t visit the State Parks, but we did get in a few of the caves and loved them! Thanks for sharing! I have to say I’m a bit disappointed in your “just a piece of man made art” comment on Mt. Rushmore and Crazyhorse. You act as though these historical monuments were ordered out of a catalog pieced together and stuck on the side of a mountain! Please, these are sculptures on the grandest scale imaginable. The fact that they were years and years in the making, only adds to the majesty of the undertaking. I don’t think someone of your generation could even conceive of such. It would be too difficult! After all “lollapalooza” and “burning man” are much more worthy of your artistic praise. Sometimes we need to step out from behind the push button technology and appreciate the struggles man has endured! Tom, you are taking this all very personal and you seemed to have missed the words right before “The monument is a spectacular feat considering it was created nearly 100 years ago”. Mt. Rushmore was always meant to be a tourist attraction (because the area needed income), which is what makes the story of all of it so interesting. Art is all personal preference and for our visit on that day, we found it interesting but not as exciting as other national monuments and parks we have been to. Please don’t make this a generational thing when it is simply a difference in experiences and personal preference. Burning man and other festivals have nothing to do with this and we didn’t make that comparison. I feel we make it clear we value mother natures art above any man made art so this has nothing to do with push button technology. I believe sometimes a factor in whether you enjoy an attraction or site has something to do with the circumstances or context in which you view them. We visited Mt. Rushmore last summer. It was a part of a whirlwind trip that started in Wyoming and a visit to Yellowstone. The day we visited Mt. Rushmore started in Cody, Wyoming. We traveled to Sturgis and then on our way out of Sturgis I creamed a good size deer on the interstate. Car was not damaged too bad. Just had to push real hard on the drivers door to get out, and cringe when you heard the metal parts bending against each other. BTW, I highly recommend the insurance from the rental car company. It paid off! So we are heading to Mt. Rushmore and make it just in time to get a good spot for the lighting of the monument at night. The weather was perfect and the lighting ceremony was really spectacular. Great shots of the Monument! I say all of this to point out that we had a long day of driving, crushed our rental car, and were payed off with a fantastic evening. If we’d gotten there during the daylight hours I may have been saying, “is that all there is?” We went back the following morning and the daylight doesnt do the monument justice. Crazy horse was next and I had the opinion of this monument that you did of Mt. Rushmore. I felt like the work was done on Crazy horse. I’m not sure that in our lifetimes we’ll see much more work. They’ve built the visitor center, have tourists, and really dont need to rush to complete anything. Just my opinion… Happy trails, and I love your work! Oh Ron, you very much seemed to grasp our experience. We loved the beauty of the whole area and will most certainly return but you can’t help but feel the way we do. So glad you were able to see the lighting ceremony and enjoyed it (especially after the day you had, oh my!). I am sure it is a sight and if we get the chance, we will try and see it ourselves. I’ll add that my family took a trip to the Dakotas one summer when I was in middle school and I personally loved it. We camped throughout the Black Hills and surrounding areas, saw Mt. Rushmore, etc. Can’t wait to read about the rest of your adventures! Ew, ignore this! I already commented but it wasn’t there last I checked. I’m not a weirdo, I promise! Inspiring! We were in your Chugach rafting group in Alaska and caught wind of your blog there 🙂 I’m jealous of your adventures. Will definitely be following your blog and can’t wait to see more! In regards to the Black Hills, I went there in middle school on a family vacation and loved them. Though nothing can compare to the beauty of Alaska now, I thought that area of country was pretty spectacular as well. Hope to go back someday. Love your blog and videos. I was wondering when you were going to take a trip through South Dakota. Being from the area and now living in a neighboring state I’m quite biased. May is probably one of the worst months to visit and this year they have had record rain fall. I honestly believe the park systems in SD are the best in the country. The state parks are beautiful and better than private parks. Custer State Park is a must see and stay. 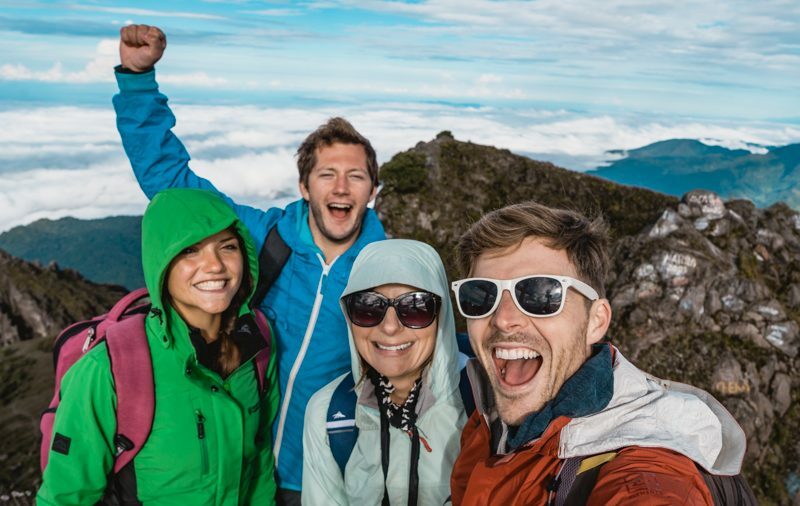 The hiking and outdoor adventures are endless. So if you end joy the outdoors you will love it. If you prefer city life and those attractions and amenities, SD is not for you. Besides Custer state park, Mt Rushmore, Crazy Horse, there is also Deadwood and Spearfish Canyon, one of my favorite drives. Devils tower is just across the border in Wyoming which is worth the drive. Just remember when visiting the Hills June is the best month. July is Hot. First weeks of August is the Sturgis rally. September is another great month to go without the crowds. One other great campground in SD is Lewis and Clark in Yankton SD. Any of the state parks along the Missouri are beautiful and full of outdoor activities. Hope you go back again and find it more enjoyable next time. Wow — I’m just astounded with your assessment of both monuments. You have no idea what you missed. The Crazy Horse monument is INCREDIBLE. The facility is amazing and the story in inspiring. You need to seriously take more time understanding why these places exist and dig a little deeper. You are clearly capable. Deb please keep in mind that what is inspiring and incredible to one may not affect another in the same way. We’re not reporters or journalists, we share our personal experiences (which may vary wildly from yours) and we did spend a lot of time watching the films, reading and truly trying to take in what we were experiencing. They are neat and interesting stories yes but they just didn’t have a profound impact on us. I am glad to hear you had a wonderful experience and enjoyed both. I’ve really enjoyed the Wynn’s travels and travails. A few years ago, we were on a trip out west with our close friends. Three weeks and over 6000 miles (by Suburban). We spent some time at the Badlands (nice), stopped at Mt. Rushmore (still cool, considering what it took to finish the project). My only real problem with Rushmore is that the viewing area is SOOOO FAR from the monument. Makes it look so much smaller than it is. Crazy Horse looks like it will be something to see eventually. The scale is enormous. The museum is impressive, but the price of admission is way to high. After we got into Montana and spent several days in and around Glacier National Park, we kind of forgot about the previously mentioned attractions. We fly fished on the Blackfoot River with a guide. Soooo fine. Driving eastbound on Going-to-the-Sun Road and into Canada was the experience of a lifetime. I would gladly do it again if my Bucket List wasn’t so big. Grand Canyon, Zion and Brice National Parks are next on our list – via our motorhome this time. I agree with you on its just there, But if you take the Rangers tour, Mt. Rushmore turns out to be very interesting. You could never get much out of just walking, the Rangers made it very interesting. crazy horse was a very unnecessary stop!! The town at the base is just a tourist trap, spent 10 minutes there and left? The advantage I have now is knowing when not to go…. How do you heat this RV in the winter? Seeing Mt. Rushmore has been a metaphor for us of all the reasons we want to tour the country in an RV. I hope we won’t be as disappointed, and our children will help us see it through less cynical eyes. Love you two”kids”, For all sorts of reasons but agree wholeheartedly with the tourist traps. I just returned from Italy yesterday and couldn’t stand being in Rome because of The throngs of tourists, hawkers, graffiti & traffic (if I never see another selfie stick it will be too soon). The countryside exploring small wineries and olive oil makers was great. Get me into my little van with my chocolate lab, and I am a happy 62-year-old camper. (I also had a cat that would take walks with me). 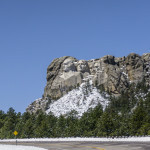 My trip out west was in ’76 and Mount Rushmore must not have been as touristy? I liked it. But I LOVED the ruggedness of the Black Hills all by themselves… Lots of America to see! We got our Ham technician license a few years ago — it was as easy as you said — but have never actually used it. We intended to use a Ham radio sailing, but had kids instead. And now we’re loading up into a Land Yacht to see the country. We’ll definitely have to get a cheap 2m portable radio and practice as we cross the country. I respectfully disagree Dave. Not whining, informing. They love to hike and they brought hiking gear. The trails were closed to them and they couldn’t understand why A few inches of snow and some slippery ground would warrant this. I would not visit Mt Rushmore. It was built on land stolen from the Indians, land promised them by treaty. Here is some more information: http://www.pbs.org/wgbh/americanexperience/features/biography/rushmore-sioux/. Personally, I think it’s a desecration and a shameful part of our history. But, the Badlands as a whole sound really interesting and I can’t wait to go. You are so so right… The Crazy Horse construction … ooppsss… monument is one of the biggest rip offs in this country. 22 bucks a head…. 1 million people a year… equals $22,000,000 a year and all they have done in 15 years is add a “museum” and put in a nice parking lot. You do the math… somebody is making a ton of cash. But… I love Mt. Rushmore… but 11 beans to just park… so much for the free National Parks. Any who… NORTH TO ALASKA!!! I think you are correct in that God’s art is much more breath-taking than Man’s feeble attempts. However, it is interesting and a national monument so I’d recommend that every citizen check it out once in their life. Crazy Horse is one step down from Mt. Rushmore for me as it is still in the early stages of construction. It’s been that way for some years as I viewed it in 1995 and it is only marginally closer to completion. Granted it is a big undertaking and it is a private, NON-PUBLIC, funded operation so it will take a while, but I think my great-grand children will have the chance to see the construction process. Oh well, on to other, more impressive Natural wonders. The BEST time to see Rushmore is during the Bike Rally the first week of August, Sure its crowded but the closing of the monument a night is Superfantastic they do a flag retreat using any former or current service members along with a video presentation and Lighting of the Monument it will send chills down your spine if your patriotic. Also the Black hills are fantastic although the Bikes are numerous the riders are very friendly and helpful. We really enjoyed MT Rushmore. It’s as much about history as it is art. We did choose to view Crazy Horse from the road instead of paying the admission. We also enjoyed Bear City near Rapid City, it’s a drive through animal park. Our favorite place in the area is the town of Deadwood. The town re-enacts Wild Bill Cody’s “aces and eights” murder and has gunfights in the street. If you take a bus tour they show you where Calamity Jane and Wild Bill are buried along with many other area highlights. Honestly speaking I agree… I’ve given my opinion to many traveling across America that I would rather spend my time elsewhere. Custer is nice. Everyone has there interests and this just doesn’t do it for me… I enjoyed the needle highway in Custer. Seeing the monument through the tunnels and at a distance on a scenic mountain road was more enjoyable. Totally agree with Mike Miller. Mt. Rushmore should not only be seen in the morning for better lighting but come back for the evening show with the lights on the monument and view the video of its history. Trals around it get you closer. You will better appreciate the significance of this piece of American tradition. You just picked the wrong time to visit the Black Hills. 8 years ago, I drove from Alberta Canada to experience Rushmore, Crazy Horse, and the trail through the Blackhills following the history of famous Wild Bill , as well as the monument surrounding Custar’s last stand. Although the monuments were “neat”, we were able to speak to elders specifically at the Crazy Horse monument and Custar’s last stand which was mind blowing to hear their version of history compared to that protrayed in Holywood movies. Secondly , although Deadwood was touristy, we had a lot of fun taking in old cavern tours, and Wild Bill’s grave site. We then had the travel bug to go to Cody Wyoming and see the Wild Bill museum. Great tour for history buffs, definitely a tour to take in the midst of the summer season though. Been there, done that and quite frankly wouldn’t go back on a bet! You went early in the season, we went when all the bikers were headed to Sturgis. Not fun. We go to the black hills every other year for 4th of July and there is nothing better than the patriotic program they put on at Mt Rushmore. We typically camp at one of the awesome campgrounds at Custer State Park. There are so many terrific hikes there in the park. You should also explore Deadwood just an hour north. I’m with you. I haven’t been and its on the very bottom of my list. I would never pay to see the over sized carving which defaces an awesome mountain (Though the PBS Special was good). I much prefer Custer State Park. There is as much wildlife and stuff to do there as there is at Yellowstone. Sorry to hear you figured the trip was a “fail”. But actually I think it was great that you really learned where your priorities are and helps you plan the future better. Enjoy Alaska !! That hasn’t been ruined yet !! You missed the best part – Devils Tower and going to Devils Tower Lodge Bed and Breakfast INSIDE the park. Frank Sommers is the master climber of Devils Tower and is the best entertainment you will ever meet in the wilderness. He is the greatest story telling, piano playing, wine tasting, tower climbing man in the business – and is a true steward of the land. Mt. Rushmore and Crazy Horse are amazing but Devil’s Tower is a natural rock formation that will make your jaw drop, especially when Frank teaches you to climb and takes you up to the top!! It’s been mentioned several times already, but I want to add that we thoroughly enjoyed the area around Mt. Rushmore. The man made monuments…meh…but the surroundings are just spectacular. Too bad they went and carved up such beautiful natural beauty. We stayed at Blue Bell Campground in Custer. The hosts were incredible, the bathhouse(s) and showers were spotless, the evening programs were wonderful (ranger talks) and Needles Highway is not to be missed. We’ve had a hard time deciding wether we should move to Montana or South Dakota! The Badlands? Just plain….bad…to the bone! And no mention of Robert’s Prairie Dog Town? C’mon!! My husband and I visited this area several years ago. I had memories of my visit in 1959, when I was eight years old. I remember parking and walking on an undeveloped tree lined trail to view Mt. Rushmore. Needless to say, I was disappointed when we visited it a few years ago. The view we liked the best was from Needles Hwy. As we came through one of the tunnels, there was the mountain. We also enjoyed a hike around Lake Louise and the drive through Custer State Park. A ranger at Mt. Rushmore told us that the native tribal people felt that their land was desecrated by the carvings. We just left the black hills, traveling with our two children, 12 and 10. We stayed at Horse Thief Campground, near Sylvan Lake Area and it was very nice and secluded. When you return, we highly recommend finding Poet’s Table off Little Devil’s Tower trail! It’s a local secret trail spur that has been a place of inspiration for locals for many decades. There are guest notebooks filled with entries dating back to the early 80’s. The fun is in trying to find it. It’s well worth it. Crazy Horse is pretty sad. We paid $28 and had the distinct feeling it was being used by the family that owns the place for something other than finishing the sculpture, like vacationing in the Caribbean in early May. We went to both Rushmore and Crazy Horse last year in September. Stayed at private campground a few miles away. Very reasonable. Throughly enjoyed both. Walked trails around Rushmore and saw it at various angles. Enjoyed Crazy Horse more as everything for sale was American made and Indians were making jewelry on site. Everything at Rushmore was from China. What a shame. Indians also put on dancing shows all included. Never disappointed that we went. Also toured Custer State Park and would go back again. Sorry you went at wrong time of year and didn’t get full enjoyment you could have. I have to disagree. We were there in Sept of 2014, and loved it! The area was great, so much that we extended our stay twice for a total of 11 days, staying at the Heart Ranch, just outside of Rapid City. 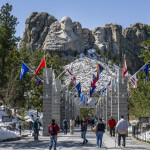 You did need to be able to get to the trail system, walking under the Rushmore monument was impressive for sure, and everyone had already told us go early in the AM for the best light. Crazy horse, also impressive, and they are doing it all on their own, they will not let the government chip in to complete, as they want to have it for their own, not controlled by politicians. So, yes, there are some extra fees, but not huge, and totally worth it, especially the bus ride up to the viewing area just below the monument. There you get a real feel for how large the project is, and a completely different view as well. Sorry you had a bad experience, mother nature had the upper hand, I am sure it would have been better in 75 degree sunny days! Wind Caves National Park is also awesome, along with the Badlands National Park, all within a 90 minute drive of Rapid City. If your followers are interested, and you don’t mind, you can let them check out the link to our blog and see the photos of our time in the area. http://todayisoursomeday.com/2014/09/23/surprised-by-south-dakota-91314-92313/ Cheers. The Native American can tell you they don’t like Crazy Horse Monument! They do not like Mother Earth carved up in that fashion! They don’t like Mt Rushmore either! It is a disgrace to Mother Earth! We had a similar situation last fall when we visited the Black Hills! They had an uncharacteristically early snowstorm in September. We were really lucky in that they weren’t prepared for it. 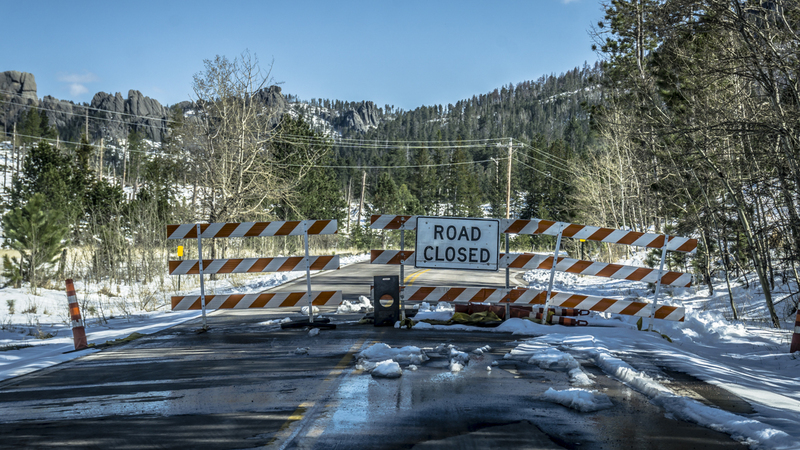 None of the roads (that are typically blocked off for winter) were blocked off yet. The snow actually allowed us to take a gorgeous white drive through Needle Highway in Custer State Park. I guess the only time to visit and be sure you won’t get snowed on is the dead of summer! Oh, another nice trip is Cave of the Winds, not Carlsbad or Blanchard but worth the tour. I have to agree with you about skipping Crazy Horse and Mount Rushmore is nice but the badlands and black hills are much more interesting to us. We are hosting this summer at Keyhole State Park about an hour west of the Black Hills and very close to Devil’s Tower which I would put on a “see it” list. I’ve only had two experiences with KOA, one several years ago I had a reservation at one in Virginia for one night and they confirmed the booking. Two days before the trip they emailed me that they were cancelling my reservation because they wanted a minimum of two nights stay. I had signed up for the KOA annual membership for the discount and was never able to get that refunded, only the camping fee. Last month we stayed at a KOA in Colorado which was nothing special but nice folks. However, when trying to plan my next stops I discovered that KOA internet censors or blocks any viewing of non KOA RV parks. Is that petty? I’ve had several friends tell me that Custer State Park is a definite must see south of Rapid City so we will head over there to explore this summer. I agree with with most of your thoughts and feelings of Mt. Rushmore and Crazy Horse. However if one was to travel to the area and so close to Mt. Rushmore, I would definitely pay it a visit. I did very much enjoy Custer State Park and the Needles Highway. Side trips might also include Deadwood, Sturgis and Wall. Wall is a cheesy road side attraction very close to Badlands, National Park. Worth the visit if one has extra time and in need of cheap gifts for those at back at home. My wife and I visited the Black Hills of South Dakota for one week in 2014. Our impression was that there were things that we would try that we missed. One week was not enough time to enjoy the area. The earliest time to visit the area is just prior to Memorial day due to weather. 1. 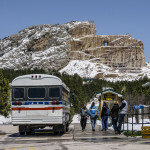 Crazy Horse Memorial – Not worth the stop. Generations of one family has figured out how to cash in on the construction of a sculpture that could have been completed decades ago. 2. 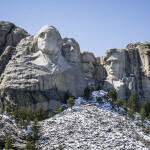 Mount Rushmore – reasonably priced for what you are seeing. The monument is free, but you have to pay for parking provided by a vendor. National Park Access Pass does not apply to parking. 3. Custer State Park – Well worth the price of a multi-day pass to access the park. It also has some of the nicest public camping in the area. Inside the park are some of the most beautiful drives in the area.. The single lane tunnels offer sweeping views of Mount Rushmore (They should, they were cut just for the views). The same drive offers “Pig-tail” bridges which were an amazing feat of engineering when they were originally designed decades ago. 4. 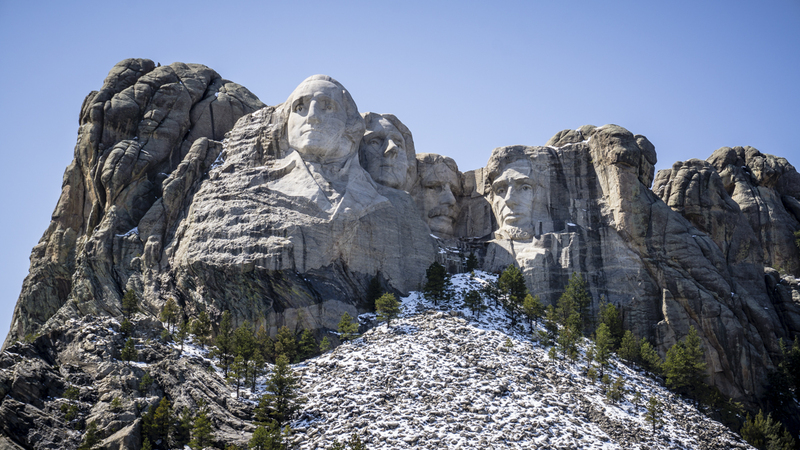 South Dakota, the Badlands and the Black Hills are home to numerous National Parks and Monuments. Get an Access pass and Visit Jewel Cave National Monument, Wind Cave National Park, Badlands National Park, Minuteman Missile National Park, Custer Battlefield National Monument and the nearby Devils Tower National Monument in Wyoming. The Access Pass is good for a year and can be used at National Parks, Monuments, BLM, and Forest Service sites. It also offers discounts on Federal camping. 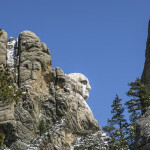 Bottom line – the Black Hills of South Dakota offer many RVing opportunities. We plan on going back. One week was not enough. I’m curious why you chose a KOA? You don’t seem like KOA people. I ask because we have a trip planned next month and that are is one of our stops. After a couple of weeks of Wild Camping it’s always nice to go somewhere to refresh our tanks, get some laundry done and so on. Especially when there is a possibility of severe weather (like a crazy 3 day snow storm). There are some great wild camping opportunities in the area but we needed a day or two of “resort” time so that is why we hit up the KOA. We agree with you guys 100%. We went through the area bout 5 years ago. While the countryside around the black hills WOW’d us…we felt exactly the same as you guys about Crazy Horse and Mt. Rushmore. Glad to hear we aren’t the only ones that felt that way. Thanks for speaking up, we felt like we were bad people the entire time but we feel its our duty to share our honest opinions. The last photo in the first set of slides – your beautiful mini snow leopard – got me to comment though :). Gorgeous! We really enjoyed our visit to that area several years ago. Took a bus tour that did Custer SP, Rushmore, Crazyhorse, and a really fun chuck wagon dinner and show. Wish we had stayed at Custer State Park. Disappointing part of our visit was the KOA. Packed in too tight in overcrowded, noisy, over-priced campground. It was late June and the weather was great. We’ve had another traveler mention the KOA being packed to the gills, I guess that’s one benefit to our early arrival! The big question I have is how well your coach performed during the very cold weather? It used to be that RVs were ill equipped for a winter experience (or even cold weather!). Did you have any challenges keeping comfortable? Water tanks freezing (or your source),etc? No issues with freezing at all, I was surprised myself. We just put a small space heater in the basement and ran the fireplace inside and all was good! I still feel Crazy Horse is not to be missed. The fact that this mountain will someday be that beautiful sculpture just blows me away. I am sad it won’t be in my lifetime. It is also important that it was commissioned by the Lakota. 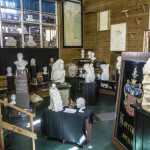 It continues to be the work of the Ziolkowski famiky, their father Korczak being the original sculptor. We were in the Black Hills area in September 2013 and loved it. The weather was just about perfect. We parked just outside of Custer State Park and drove in several times, taking a different route each day. The wildlife and scenery were spectacular. Our visit to Mt. Rushmore was spur of the moment. We made a last minute decision to see it as we were driving down the highway after leaving Custer. I was more impressed with the historical exhibits than the actual stone carved figures. How they did it, using the tools available at the time, was fascinating. We skipped Crazy Horse for the same reasons you did, although plenty of people have told us we made a big mistake. We spent at least a week in the Rapid City area, staying at Rush No More Campground near Sturgis. The rally was long finished, so it was peaceful and pretty. We took a day trip back to Deadwood and that was interesting, but skipped the casinos as that’s just not our thing. Then on our way to the Badlands, we stopped at Wall Drug, also not our thing apparently. I fail to see the attraction … maybe we’re too old to appreciate it like kids do and too young to appreciate it like the senior citizens appear to! The Badlands are impressive. We parked our rig at Cedar Pass, one of the National Park campgrounds, then drove/hiked and thoroughly enjoyed the area. All in all, we loved South Dakota and we look forward to a return trip someday. Thanks for sharing Shari, we too look forward to a return trip to explore Custer State Park and the surrounding black hills hikes. Yup, definitely sounds like you were there at the wrong time. We stayed at Game Lodge campground in Custer SP and had a herd of a couple hundred bison walk fifteen feet behind our RV! The wildlife loop drive, Jewel Cave, Needles Highway, Sylvan Lake, Mt. Rushmore’s evening program, the trails by the base of Mt. Rushmore were all highlights. You should give the area another chance. And we love the Badlands too. Great camping by the Visitors Center. Thanks for sharing Kent, we fully know we need to give it another chance…too many people have told us its one of their favorite places in the USA! Check and check. We felt the exact same way about Mt Rushmore and Crazy Horse. We paid the parking fee at Mt Rushmore but didn’t go any further than the restrooms. It was sleeting (and this was Memorial weekend 3 years ago, we also woke up to snow in Billings, MT – us traveling from KY to WA, in nothing but shorts and flip flops…). The best view was from the road honestly. With two kids and rain, it just wasn’t worth it to us. 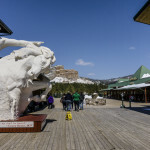 We pulled up to Crazy Horse and heard the cost (and decided that was CRAZY!) and did the u-turn. I seriously think we had more fun visiting the biggest ball of twine somewhere in Missouri (or wherever it was between our week long journey from Louisville, Ky to Seattle). Hi Kids, What a bummer! We do love the Black Hills area and that’s why we keep going back when on our way to the Pacific Northwest. We also have a membership to Hart Ranch and we love it there. We’re very comfortable when in the Rapid City area. We camp in Custer State Park every summer and love it! It is much more exciting to go to Mt. Rushmore and Crazy Horse during the summer when it is busy and there are things going on such as Native dancers, vendors at Crazy Horse, and performers on stage at Mt. Rushmore. The lighting ceremony at dusk is cool at Mt. Rushmore. We do not do that every summer but I think it is worth it if you have never been. We stay at the Game Lodge Campground and go to Sylvan lake to swim, paddleboat, fish and hike. The Sunday Gulch trail starts behind the lake and it is by far my favorite trail ever (lots of rocks and a stream that you follow the first half)! We also drive the Wildlife loop every year where you can see antelope, buffalos, big horn sheep, donkeys, prairie dogs, and maybe some turkeys. We drive to the spires and the pigtails very scenic with rock “caves” you drive through. We hit Custer and Hill City and walk through the shops, art galleries and eat at Pizza Works and the Alpine Inn. You can also rent bikes and bike the Mickelson Trail. I am sorry your experience was not a great one in the early spring but during the summer the area is a very fun place to be. I guess it is also a persons perspective and what kind of experience you are looking for since it is not Disneyland. We live in the area so we also frequent The Badlands (the stairs trail) and Wall Drug (their cake donuts are the best and kids can cool off/get wet at the outdoor water display)! Come back during the summer when there is not a foot of snow and there are activities going on such as summer nights in Rapid at Main Street square! Might change your mind! So sorry to hear you were disappointed in this area, I definately think it was just the wrong time of year. My husband & I have seen Mt. Rushmore many times over the years (most times from the road, not paying to go in) and it never disappoints. The Sylvan Lake area is gorgeous with many really nice hiking trails. Rock climbing is big in the area if you’re into that. Needles Highway is a stunning drive not to be missed. Hope you get to swing by this area again some time and give it another chance. Completely agree with everything that you said. It was a journey and a half to get to Mt. Rushmore, only to be underwhelmed by the sight. I still believe the most underrated attraction in the US are the Badlands. Shoot! I hate to see this poor review on your site. I was thinking of you both during that storm because I knew that you were in the area. I definitely love the Black Hills, not for the attractions, but for the hikes & wineries & local color. Crazy Horse is the place to go only during 1 or 2 weekends a year when they have the Volksmarch where you can Hike to the top. There is a large landing on the out-stretched arm & you can see the face up close! Don’t cross us off your list for good. —Just come back in the summertime. Or in the Fall (After May and BEFORE October if you want to avoid possible snow storms). I would suggest avoiding the area during the Sturgis Motorcyle Rally. We went thru the area back in the 80’s and didn’t realize the event was at the same time as our visit! Tons of people. Wasn’t a good experience. Stayed to view Mt Rushmore lit up at night and that was pretty cool. But had such a bad experience with a hotel in the area that we decided to leave and drive thru the night. We were so stubborn we didn’t stop until we were out of SD and into Wyoming! In all our travels over the last 40 + years as a married couple, our favorite spots are Big Bend National Park and the Badlands National Park. So natural over man-made rates much higher to us. Having said that Mount Rushmore is a special stop if you go to the evening program, lighting ceremony. As someone said, early May is not the best time to visit, usually too cold. And a big second to visiting the Needles and the Custer Wildlife road. And then there is Wind Cave (or Jewel Cave) and the hike to Harney Peak. I am sorry that you had a bad experience in, what can be, a lovely area at the right time of year. Oh, and Crazy Horse is a big waste of time. We’ve visited the area several times, though never early enough to be beset with snow. However, we suffered, not once, but twice from the same mistake. The last two times we were in the area, 2010 and 2014, ended up being during the Sturgis motorcycle rally. While most of the impact of the rally is in the area towns, a very large number of motorcycle enthusiasts travel the area roads which adversely impacts other visitors, in our view. Iron Mountain Road is a spectacular drive most of the time, but becomes less than enjoyable when competing with bikers. So far as Crazy Horse, we agree completely. We never even got off the highway. 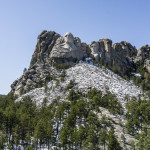 The best part of Mount Rushmore, though, is to see it from the trails you could go on, with views of the figures from different angles than are usually seen. One of my 2011 blog posts has a “video slide show” of Rushmore that includes some photos from the trails. Fortunately, on our 2014 trip we camped at Wind Cave National Park and most of the biker activity didn’t go that far south. As well, we were able to visit some places early in the day before too many bikers got there. 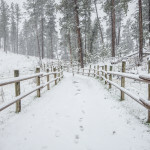 With respect to your snowy experience, last September 10th we were leaving Grand Teton National Park with plans to stop at Boysen State Park in Wyoming. We checked the weather an discovered that Boyson was expected to have several inches of snow, so we made a reservation for the Casper, Wyoming KOA. We ended up getting an inch or so. 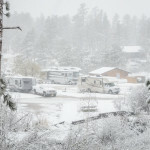 However, the Black Hills area got as much as 8 inches and Rapid City saw its earliest snow in 120 years. Thanks for the tips! We’ll be leaving the East Coast, and will be passing through the Black Hills in about 3 weeks. Yes, Mt. Rushmore is a bit of a letdown if people have told you how wonderful it is. But the surrounding area is what is the big attraction for us. You were there much too early. You need to go back when the weather is warm. Drive through Custer State Park and see the buffalo and feed the donkeys. There are also alot of really nice hikes in Custer and just driving the needles highway is a great scenic drive. Next time stay either in Custer or at Rafter J Bar Ranch. Rafter J is just down the road from the KOA and has much bigger sites, better scenery and is cheaper. We visited Mt. Rushmore last summer. We thought it was amazing, and we’re glad we went. But. The whole area is way too commercialized and touristy for us. And this from people who love DisneyWorld! I don’t feel like it has much to do with patriotism, but is a great artistic and engineering achievement. We enjoyed Theodore Roosevelt National Park, just over the border in North Dakota, so much more! I was unimpressed with Crazy Horse and Rushmore. I was amazed at the level of commercialization at Rushmore, and our problem was, we got there in summer, lots of people, but we couldn’t take our little dogs anywhere other than the parking lot, and we didn’t want to leave them in the RV. So, very limited view. 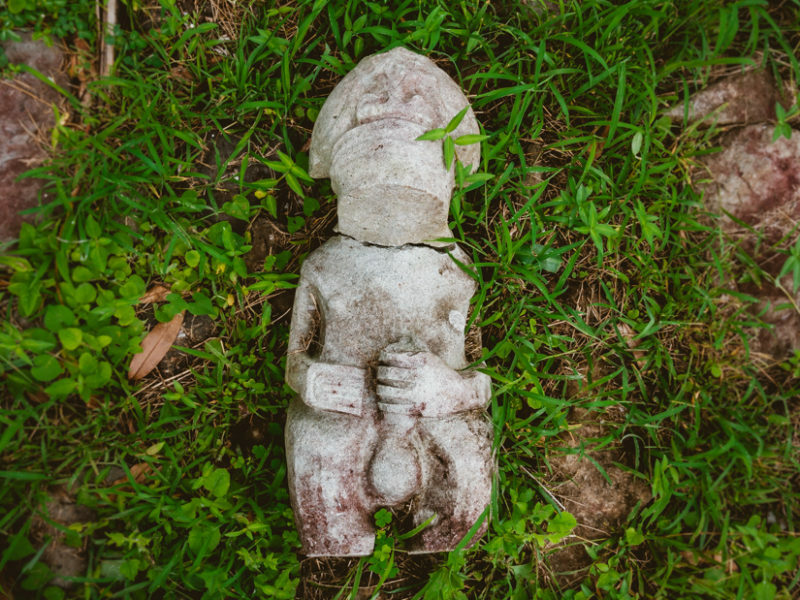 It’s an amazing feat of sculpture, but I empathize more with the Native Americans about desecrating the landscape. I agree totally with your comment that the “feel” at Crazy Horse was off; we didn’t pay the entrance fee either.